Congratulations to our next Certificate of the Month Winner, Nathan Knottingham of the Knowledge Coop for their training certificate! 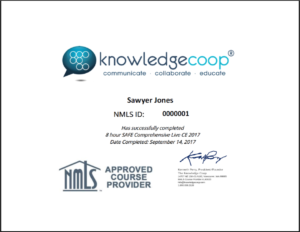 The Knowledge Coop is a training company that provides high quality and entertaining licensing programs to mortgage loan officers in both live and online classes. They also provide intranet services and custom video content to businesses that are looking for excellence. The Knowledge Coop takes a unique approach when providing training to an industry that is highly regulated – they actively look to inject a sense of energy and fun into their classes. This helps to counter what can become an overwhelming amount of information and material. You can get a glimpse of this when looking at the Knowledge Coop’s certificate, with it’s simplified design and prominent company logo. Nathan also utilizes a Merge Field to import a recipient’s NMLS ID directly onto their training certificate. These factors come together to create a certificate program that’s valued, and fully automated. Lastly, we couldn’t help but notice that the Knowledge Coop is located in the great Pacific Northwest of the United States. We love that SimpleCert customers are from around the world, ranging from five different continents, but it’s rare that we have an opportunity to recognize a company with roots so close to ours! Hats off to the Coop – another great Portland, Oregon area company!